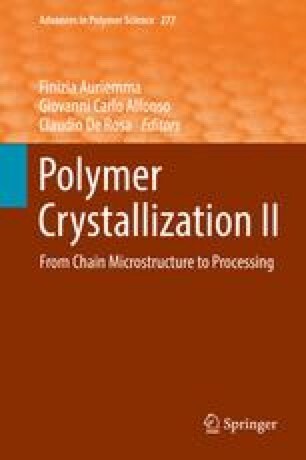 Rather than an exhaustive review of the numerous reported studies of strain-induced crystallization (SIC) in natural rubber, this chapter discusses some aspects of the physical mechanisms involved that we think are fundamental for understanding crystallization kinetics and processes such as reinforcement. We mainly focus on the rich information that can be retrieved from X-ray diffraction studies. In particular, we show how easily knowledge of the strain state of the amorphous fraction can be obtained quantitatively from X-ray diffraction patterns and how informative that knowledge is. Considering, for instance, the hardening sequence observed during stretching, it is clear that no prediction of the stress level can be made without knowing both the crystalline content and the average elongation of the remaining molten chains. Particular emphasis is put on the strain relaxation effect that accompanies SIC in both static and dynamic conditions. This fundamental effect is described in the theory of SIC developed by Flory, which we present from an innovative perspective to emphasize its deep analogy to the liquid–gas phase transformation. In spite of the fact that Flory's theory has only been qualitatively verified experimentally and is limited to static and equilibrium conditions, it grasps the essential of the driving mechanisms at play. Some simple experiments are presented within this framework that should enlighten the most fundamental aspects of SIC. The crystallization kinetics underlies most aspects of SIC and is discussed in detail. Tensile impact tests, which allow conceptually simple but very informative experiments, are treated first. We try to show that the time dependence of the crystalline content is tentatively related to the mechanism of strain relaxation in a simple manner. Knowledge of crystallization kinetics is also essential for explaining the hysteretic behavior observed in dynamic conditions. Similarities and/or differences between dynamic and static SIC are discussed.